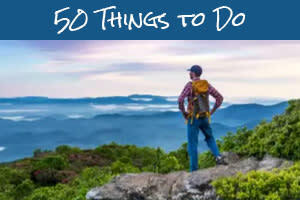 With the beginning of December, the holidays in Asheville enter full swing! Three more Asheville light displays begin this weekend and Santa goes extreme at Chimney Rock to gear up for delivering presents around the world. 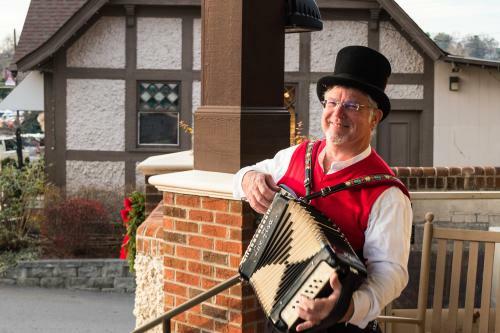 Already underway are long-standing Asheville holiday traditions including Christmas at Biltmore, the National Gingerbread House Competition Display at The Omni Grove Park Inn, and the twinkling Winter Lights display at the North Carolina Arboretum. Discover all the ways Asheville showcases its holiday spirit with our roundup of 8 ways Asheville sparkles for the holidays and our guide to the Top 8 places to see the lights in Asheville! The beautiful, historic district of Biltmore Village transforms to transport you back in time to the days of Charles Dickens and A Christmas Carol! 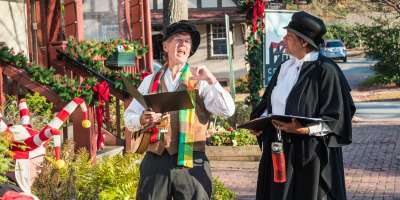 The Old World Dickens in the Village Festival is an immersive holiday experience featuring performances by strolling carolers, actors and musicians dressed in costume. The 2018 festival has greatly expanded. That expansion includes an enhanced lights display. 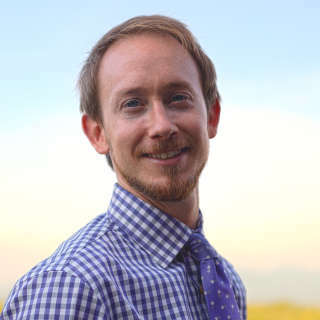 A new highlight will be the "Mugs of Merriment," a free tasting event and hot drink contest on Friday from 5-6:30 p.m. Also new this year, is the "Show and Tell Pop Up Market" on Friday from 11 a.m. to 7 p.m. The market will offer local crafts and gifts items, and hands-on classes. Saturday (Dec. 1), 2:30 p.m. to 6 p.m.
Biltmore Park Town Square, a premier shopping and dining district in South Asheville, rings in the holiday season with a family-friendly celebration and tree lighting ceremony! "Holiday Magic & Memories" includes craft activities, face painting, music, stilt-walkers, strolling entertainment, balloon artists, caricatures, magicians and refreshments. The celebration has been moved inside the Hilton Asheville Biltmore Park. 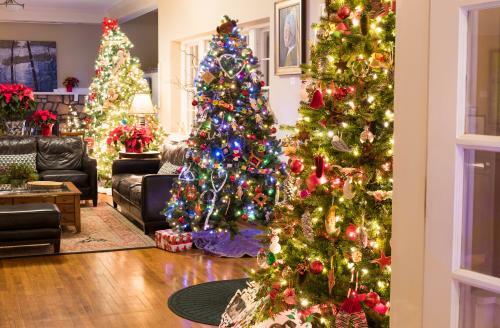 The lighting of the Christmas tree is at 6 p.m.
Saturday (Dec. 1), 11:30 a.m. to 2 p.m.
There’s no way Santa could make it down so many chimneys around the world without practice. What better place to prepare for his Christmas deliveries than on one of the world’s largest chimneys: Chimney Rock. 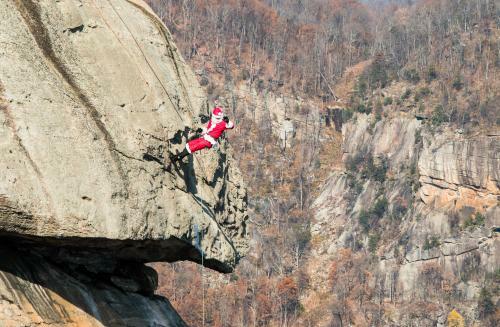 Watch Santa rappel down the 315-foot granite rock outcropping at Chimney Rock State Park with the help of his professional rock climbing buddies from Fox Mountain Guides. He&apos;ll rappel down at 11:30 a.m., 12:30 p.m. and 1:30 p.m. At the top of each hour between rappelling down the rock, Santa will take a break so that he and Mrs. Claus can visit with children and families. Enjoy live holiday music, hot cocoa, cookies and kids’ activities, and meet animal educators. In nearby beautiful Black Mountain, The historic Monte Vista Hotel comes alive with twinkling lights and decorated Christmas trees. From the hotel&apos;s featured art collection to live music, from drink specials to the decorated trees, there&apos;s much to enjoy at this great event. See the trees, November 30, 2018 through January 6, 2019. Saturday (Dec. 1), 1-3 p.m. Enjoy the sights and sounds of the season as you experience the town of Weaverville&apos;s Annual Christmas Parade! The parade begins at North Buncombe Middle School and continues down Main Street to Yost Street. 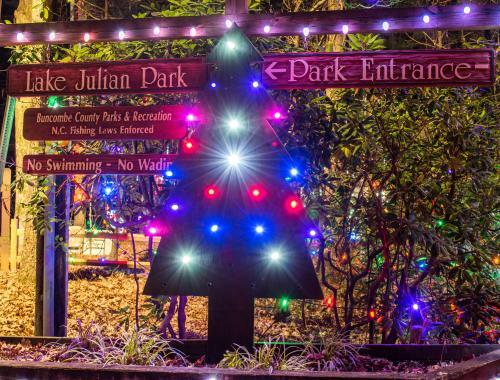 Saturday night is the kick off for Lake Julian&apos;s Festival of Lights in South Asheville. This lakeside park becomes a magical journey through 50 animated and stationary light displays. On Saturday night, you can walk through the light show -- the only night you can enjoy it on two feet. For the rest of the celebration (Dec. 2-23), Festival of Lights is a driving tour. Saturday (Dec. 1), 10:00 a.m. – 6:00 p.m. Climb aboard the Craggy Mountain Line in nearby Woodfin for a holiday train ride! You&apos;ll be transported back in time on a 1940s-themed trolley tour. This family-friendly event includes train cars decorated like a winter wonderland, a visit by Santa and his elves and a mountainside ride along the historic Craggy Mountain Line Railroad. This is a ticketed event and tickets must be purchased in advance. 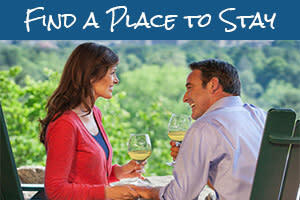 The tour operates December 8, 13-15, and 20-22. Saturday and Sunday (Dec. 1-2), 12 p.m. to 6 p.m. This popular indie arts festival, a regional favorite, celebrates its 10th year this weekend. There’s a $5 cover on Saturday for the preview party, and then Sunday is free and open to all. Shop for handmade, creative crafts from more than 170 artists. Saturday, Dec. 1, 10 a.m. to 4 p.m.
Give the gift of handmade art! Makers of the Southern Highland Craft Guild are selling their 2018 inventory in the auditorium of the Folk Art Center, a top attraction on the Blue Ridge Parkway in Asheville. Choose from a variety of gift items including ceramics, jewelry, wearable fibers, paper, glass and wood from 10-50 percent off retail. Saturday, Dec. 1 - Sunday, Dec. 2, 9 a.m. to 5 p.m. This 4th annual holiday flea market is a must-do for collectors of antiques and vintage goods, art seekers and sellers. Discover the best in vintage and local handmade while you connect with 150 local and regional vendors and artists. Friday and Saturday (Nov. 30 -Dec. 1), 10 a.m. to 4 p.m.
Find the perfect holiday décor from this garden center in the nearby town of Hendersonville. Shop for Amaryllis, Poinsettias, Cyclamen, custom wreaths, ornaments, and handcrafted holiday craft items. Friday (Nov. 30), 8 p.m.
Kansas, an iconic classic rock band, performs in downtown Asheville this Friday. This “garage band” from Topeka released their debut album in 1974 and has since gone on to sell more than 30 million albums worldwide. The Quartet is considered one of the finest chamber music ensembles performing today. The Calidore String Quartet made international headlines as the winner of the $100,000 Grand Prize of the inaugural M-Prize International Chamber Music Competition in 2016, the largest prize for chamber music in the world. The Quartet will play classics by Haydn, Mendelssohn, and Beethoven. Joshua Messick&apos;s Hammered Dulcimer Christmas shows are a not-to-be-missed holiday tradition in Asheville. In addition to the sparkling tones of the dulcimer, Messick’s crystalline acoustic arrangements of seasonal favorites include the sounds of Celtic harp, strings, flute and percussion. Saturday (Dec. 1), 6 p.m. – 11:00 p.m.
It’s the one-year anniversary of this Biltmore Village cider house. TreeRock celebrates with hot jazz from the 20’s & 30’s performed by the Gravyhouse Storytellers. You&apos;ll also enjoy food from Cecilia’s Kitchen. Take your pick of a large selection of ciders and meads plus beer and wine. And, you have a chance to win prizes! Asheville Gallery of Art’s December show, “Energy and Life” features the works of Sun Sohovich and Kari Swanson. Their complementary blend of impressionistic and abstract styles creates glimpses of everyday life filled with vitality and color. Sunday (Dec. 2), 1:00 p.m. – 4:00 p.m. Create your own holiday décor! Zentangle® is an easy-to-learn, relaxing way to use structured patterns—called “tangles”—to decorate pretty much anything you can imagine and turn it into a masterpiece. By the end of the workshop, you will have learned how to shape a 3D star, as well as several basic tangles, the strokes necessary to make them, and how to add color and shading to make your creation really SHINE!